I love heading to the local farmer’s market this time of year because they have the best assortment of mushrooms! 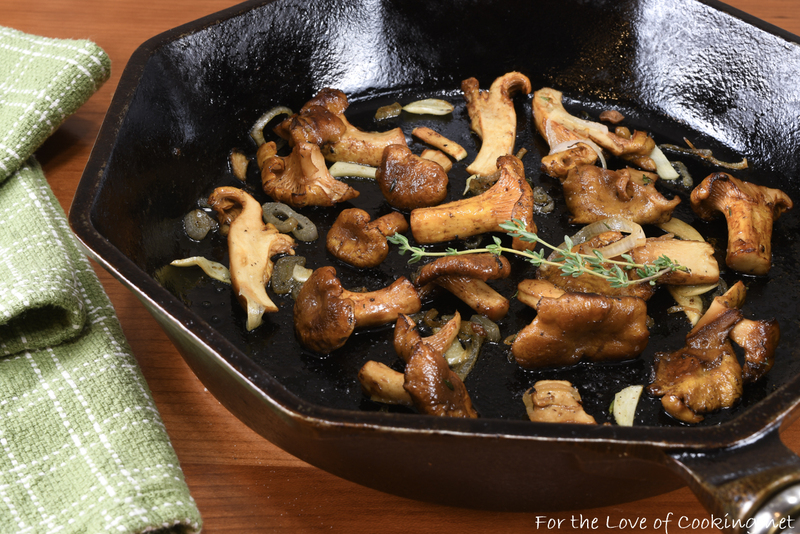 I have ALWAYS loved mushrooms and one of my favorite varieties are chanterelles. I picked some up this weekend and decided to roast them. 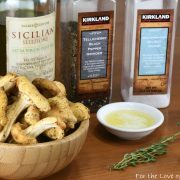 I usually roast all mushrooms (button, cremini, portobello, and chanterelle) the same way – tossed in some melted butter with shallots and slivers of garlic then seasoned with a bit of fresh thyme leaves, salt, and pepper. Simple. Perfect. You can make them a little healthier by using olive oil instead of butter but I think butter and mushrooms are meant to go together. 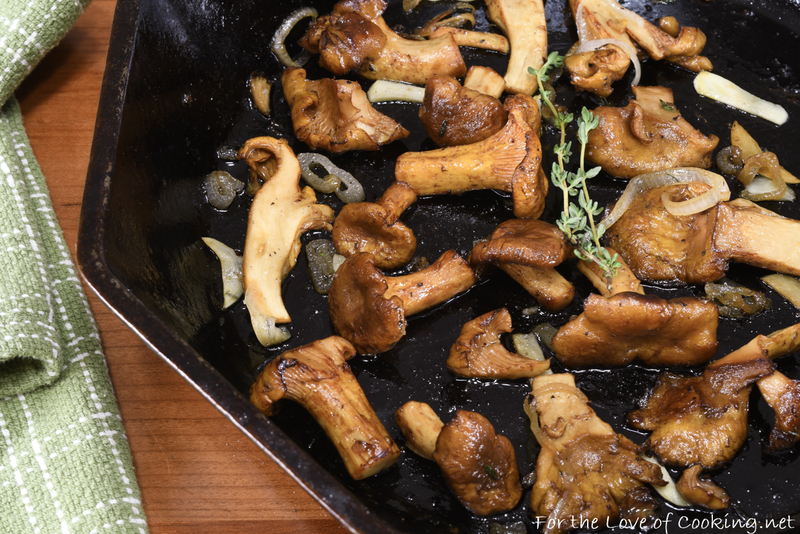 These roasted chanterelle mushrooms took about 15 minutes to make and tasted heavenly. I ate half on their own straight from the skillet, then the other half on my baked potato for lunch, but my favorite way of eating them is with a medium rare steak. Delicious! Preheat the oven to 400 degrees. Coat the bottom of your cast iron skillet with a teaspoon or two of olive oil; swirl to coat evenly. Clean the mushrooms then slice the bigger ones in half or quarters, depending on the size. Place the mushrooms, shallot, garlic slivers in a bowl. Drizzle the melted butter over the mixture then season with some fresh thyme leaves and sea salt & freshly cracked pepper, to taste. Toss to coat evenly. Pour the mixture into the prepared cast iron skillet. Top with a sprig of fresh thyme. Place into the oven and roast for 10-12 minutes making sure to stir them halfway through roasting. Serve immediately. Enjoy. Clean the mushrooms then slice the bigger ones in half or quarters, depending on the size. Place the mushrooms, shallot, garlic slivers in a bowl. Drizzle the melted butter over the mixture then season with some fresh thyme leaves and sea salt & freshly cracked pepper, to taste. Toss to coat evenly. Pour the mixture into the prepared cast iron skillet. Top with a sprig of fresh thyme. My favourite mushroom! This is simple yet very delicious! Roasted mushrooms are delicious. Your recipe would make a great side dish for Thanksgiving. 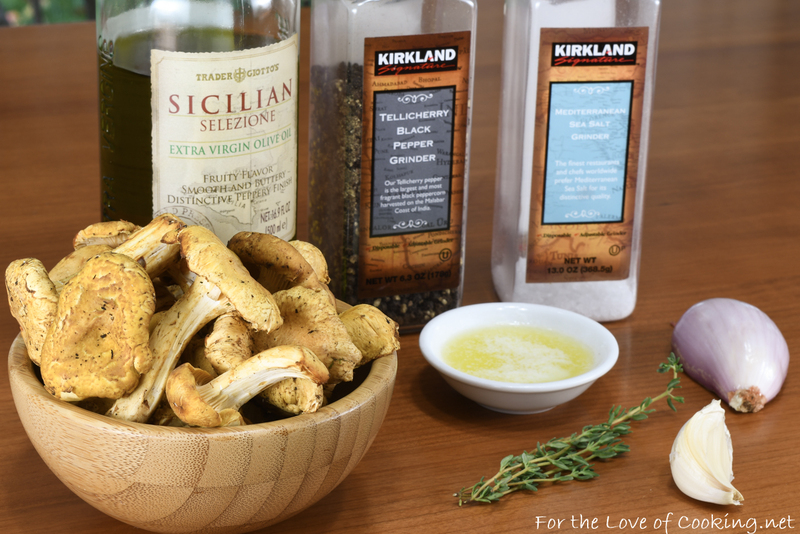 I always saute mushrooms for my menfolk in olive oil. I know they’re supposed to be done in butter, but I have to think healthy. 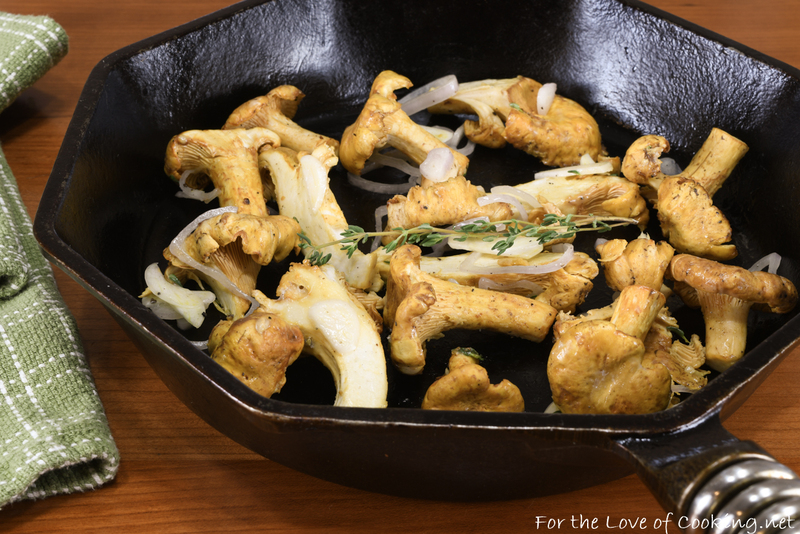 And you know I don’t eat them myself because mushrooms are fungus 😉 I wonder if I could roast a ton of them for Thanksgiving….the menu must be planned THIS week….